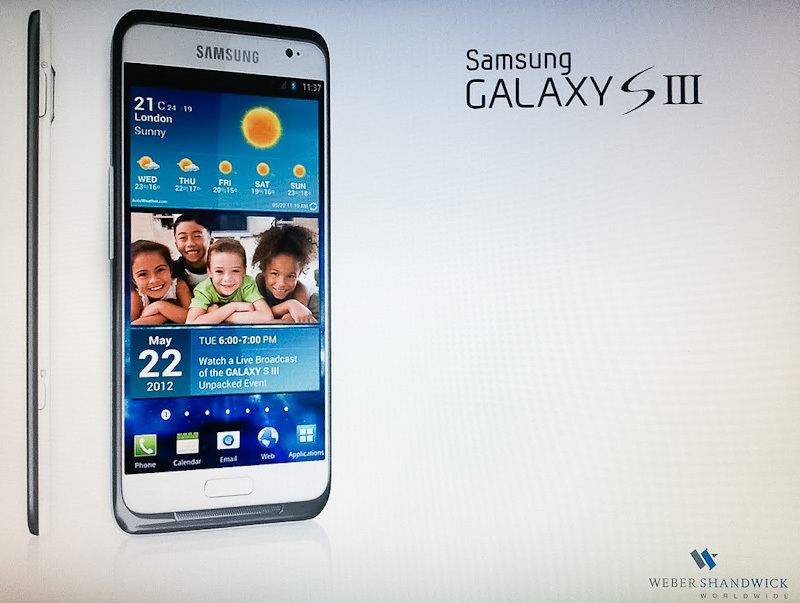 We’ve been hearing a lot about the Samsung Galaxy S III, the successor to the incredibly popular Galaxy S II smartphone. There have been numerous rumors on its release date and several very fake renders of the device. Now we are sharing the above image, which appeared on Reddit this morning, because it certainly looks more credible than whatever we’ve seen so far — note we’ve cleaned-up the original image a bit and you can click to enlarge. First off, we have what seems to be a photo of a projected image on a screen, rather than a ‘perfect’ render. Then, there is the logo of PR firm Weber Shandwick, with which Samsung has been working with in different regions. The actual device follows what we’ve been hearing so far, i.e. a very slim left and right bezel (and you know how much we loath big bezels) and a very slim profile, perhaps even just 7mm thick. On the left you’ve got the volume rocker and on the right there’s a power and dedicated camera buttons. 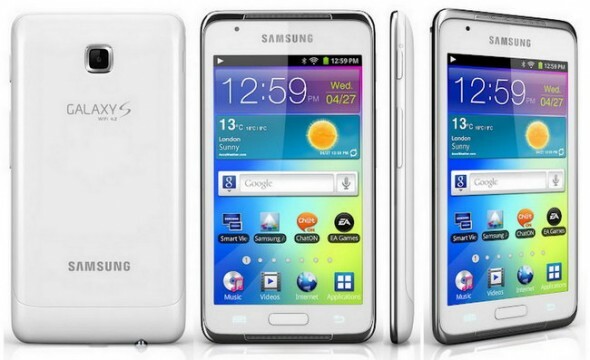 This certainly matches Samsung’s preferred layout, similar to what we’ve seen on the Galaxy Nexus (full review here) and the Galaxy S II. Now we are slightly put off by the lack of on-screen buttons, which we would expect from an Android Ice Cream Sandwich device, and instead the use of a physical home button. We would assume the home button is joined by touch-sensitive back and options buttons on each side. The purported Samsung Galaxy S III has a white back and front with a metallic rim like the one we’ve seen on the Galaxy Note 10.1 and the 7-inch Galaxy Tab 2. Now if you look at the screen, the location is London and the calendar reads Tuesday May 22 7-8pm, Watch a live broadcast of the Galaxy S III Unpacked Event . You may wanna know that the Olympic Flame will be landing in London on May 18, and will be touring the UK until the opening of this year’s Summer Olympics. 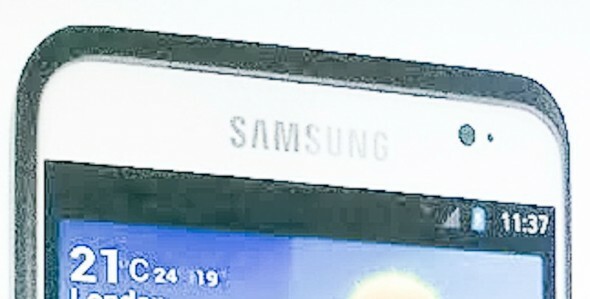 Samsung is a major sponsor of the London 2012 Olympic Torch Relay. If this does pan to be real, Samsung fans are certainly looking to a whole-load of TouchWiz-skinned Ice Cream Sandwich. UPDATE: We’ve now more closely examined the image and if we blow-out the highlights you can see that the top of the device and the notification bar have been altered — square patches of solid color pasted on top.